Over 600 students are enrolled in University of Texas at Austin chemistry professor Gail Grabner’s Fundamentals of Biochemistry Course. Every Tuesday and Thursday these students cram into lecture halls during three separate class periods, but not to listen to professor Grabner lecture over new material. Grabner has flipped her class, so every student is expected to come to class already knowing the material for the day and ready to apply the technology-enabled lessons for a richer in-class experience. Biology pre-med senior Sam Scarborough watching one of professor Grabner's video lectures on enzymes. Is the flipped model working as educators envisioned when they launched these kinds of courses just a few years ago? And how has the model been tweaked and adjusted as the result of lessons learned by educators and students alike? In a flipped classroom style course, the professor records their lectures and posts them on the course website where students can access them at any time. Students are assigned lecture videos to watch and readings to read before coming to class period. During the time that would normally be used for a lecture, the professor and teaching assistants go over practice problems, review material, and answer any questions that students have. “Basically it’s like a study session during the lecture period,” professor Grabner said. Grabner began teaching a fundamentals of biochemistry course in the fall semester of 2011. Two years later she decided it was time to flip her course. The Center for Teaching and Learning, an organization run by the university that works to improve learning environments on campus, provided tools which helped Grabner flip her course. The center offers a course which teaches professors like Grabner how to handle flipping their class. This course helps teachers effectively translate their lectures into videos that students can digest. It follows the five tenets laid out in a recently written article by Dennis Pierce, “Five Keys to Flipped Learning Success”, which outlines the steps that interested professors should take when flipping their classroom. The first point that Pierce makes in the article is that what happens inside the classroom is more important than the lecture videos that the professor posts. In class activities need to make the students think about the material at a deeper level, and make coming to class worth it for the students. However that doesn’t mean that the videos are unimportant. The second point covered in the article mandates that course videos need to be short. Professors can’t post 45-minute videos of themselves lecturing and expect students to pay attention for the entire time outside of a classroom setting. The last three pieces of advice that Pierce gives to prospective class-flipping professors are to always keep in communication with students, go through the original class-flipping process with a peer, and above all be patient. Flipping a course takes time and the professor needs to make themselves even more available to their students than in a normal lecture course. Several professors around the University of Texas have held flipped classes for a while, according to University of Texas Vice Provost of Higher Education and Policy Research Harrison Keller. The university has a vested interest in making sure that these courses are successful. Four years ago it launched a large scale course redesign project aiming to improve the classroom experience for students. This initiative has brought about several new methods of teaching in addition to an increased focus on flipped classes. When the initiative began, the university also started creating massive open online courses, or MOOCs, to expand university education beyond its tuition paying student base. These MOOCs incorporate many elements similar to MOOCs such as recorded lectures, online problem sets, and direct help with the professor and teaching assistants. “I think that there are ways that technology can be used to create new learning experiences in-person and online,” Keller said. A sample Sapling Learning module that students can use to reinforce concepts they learned in lecture videos and readings. The course incorporates many different tools to increase student activity in and outside the classroom. On their own, students use the course website for lecture videos, powerpoints, and quizzes, the textbook website. Students are also required to use Sapling Learning and Quest, websites with assigned homework problems designed to reinforce the material covered in lecture videos and readings. In the classroom students use iClickers to answer practice questions. The Canvas platform is used in just about every class on the University of Texas campus (with a few exceptions which use the previous iteration of course websites, Blackboard), but flipped classes make particularly heavy use of the platform. Every lecture video is available to watch and rewatch on Canvas, and Canvas quizzes after each video force students to reflect on what they have just learned. None of these tools are new to the education scene, flipped courses are just taking a different approach with them in order to teach huge lecture halls full of students. Whenever a student answers a question incorrectly on their iClicker during class, there are multiple teaching assistants available to help. Each section of Grabner’s biochemistry course has one graduate teaching assistant and five to seven undergraduate teaching assistants available during class to help students work through problems. These flipped classes actually lessen the workload of teaching assistants. Collier said that the undergraduate teaching assistants are only responsible for reviewing course material during lecture times and proctoring exams. Graduate teaching assistants have similar responsibilities, with the addition of scheduled office hours throughout the week. Since switching her course to a flipped classroom format, Grabner has seen a significant change in the grades that students are making in her class. Before the switch, the majority of her students were making C’s and B’s with around four students scoring a 95 or better on any given test. After flipping her class the exam averages improved with about 35 students earning a 95 or higher, but what really surprised Grabner was the change in the spread of grades. “It basically shifted B’s and C’s to A’s and B’s, and that’s been pretty consistent.” Grabner said. Students seem to have differing opinions on flipped classrooms. 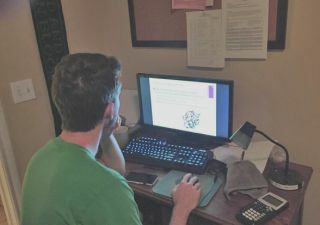 Biology Pre-medicine senior Sam Scarborough is taking professor Grabner’s biochemistry course this semester, but he isn’t as satisfied with the course as Grabner is. Grabner’s biochemistry course isn’t the first experience Scarborough has had with flipped classrooms. Unfortunately the first flipped class he took left a sour taste in his mouth. Scarborough took an animal psychology course during his sophomore year which relied solely on outside of class readings to teach class material to students. There weren’t any supplemental material for students to use to better understand the material. “I think [flipped classes] could be used in a way that’s as good as an in-person lecture, but I don’t think it could be better.” Scarborough said. Despite fluctuating student opinion on the flipped classroom model, professor Grabner can’t see herself going back to teaching a standard lecture style course any time soon. Adam Humphrey is an editorial intern for NewBay Media's AV Network. He is a journalism student at the University of Texas at Austin.